Lots to do, I plan on keeping some notes, providing some pictures and linking to threads where the nice folks on this forum are helping me out. Or sources out on the web. I had to start by getting the whole thing sealed up for winter. Removed a massive amount of silicon caulk (the devils spawn) and since I did not have any snap caps or washers I sealed rivets with white liquid electrical tape. Seems to have wintered well. Replacing the old style propane tank and regulator with the modern one. In taking the tank off found the copper line had ruptured at the low point so I'm thinking water collected and froze. Some of the jelousie window latch brackets are broken, but I still have the handles. Going to need to make some brackets. 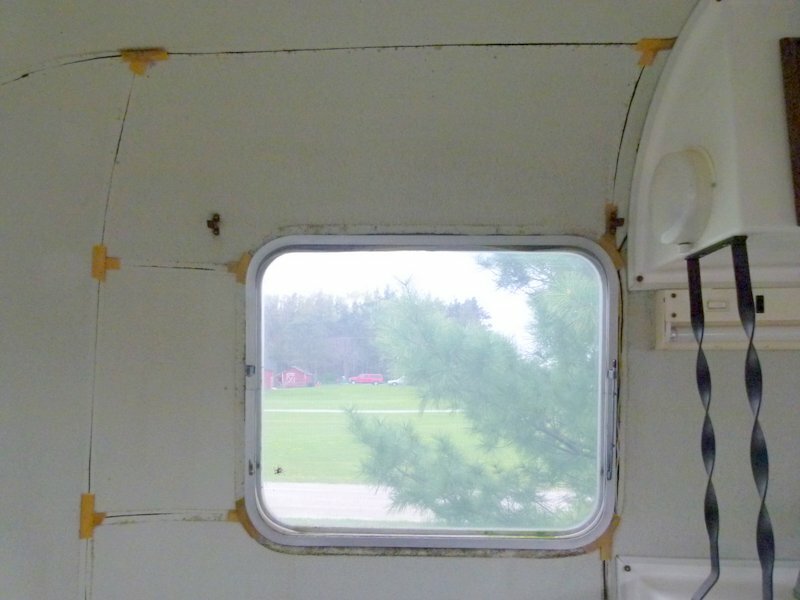 Front window leaked (no latches) so prev. owner caulked it shut and screwed metal tabs across window and frame to lock it closed. Window is glazed with silicon caulk, still seeps a little water and pushing on the caulk one can force the water out from under it. Sigh. Wood bunk support under window is getting de-laminated from the window moisture. So that has to be replaced. Betting that wood supports for couch along wall will also need to be replaced. The plastic water fill, cord port and drain are rotted from UV. Elephant hide has not been really scrubbed in years, working on that now and pulling the yellowed seam tape off. Leaving a little seam tape at the over lap points so I will have a guide to replacing it in order. Stove top is not anchored. Parts are gone and company out of business. Curtain rod brackets are all rusted. Door handle works but is rusted and the chrome is very pitted. Hinge bolts are rusted half through and bottom one is bent. Decals are but a faded relic of days gone by. Scamp and stripe are ok but pretty faded and chipping off. 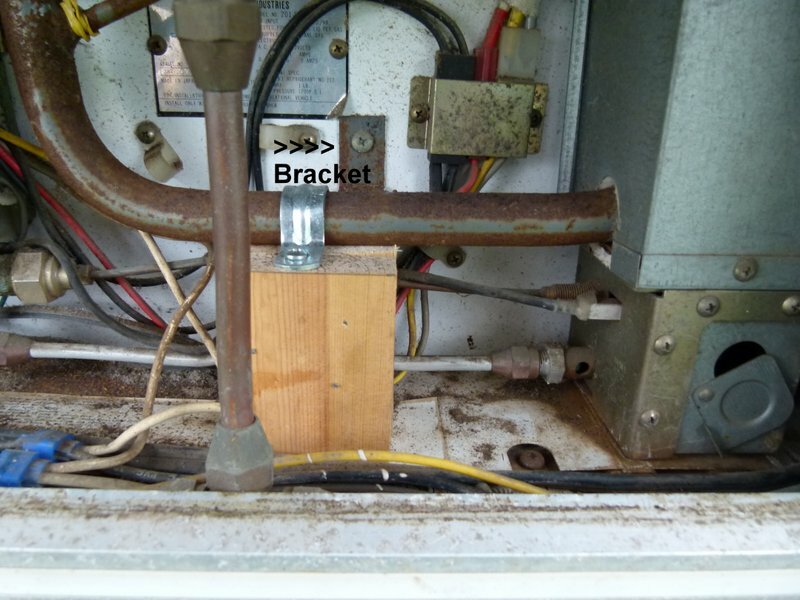 Fridge - the bracket that holds up the heat exchanger pipe and chimney is broken off the pipe. Busted the weld. Plastic trim that seals fridge access panel is cracking up from age. More silicon caulk to remove. Water tank not anchored or hooked up but lines still in place. Wasp nests almost fill the roof vent and furnace chimney. AC light over sink clear plastic shade is so yellow it's like candle light. Under couch storage the door was removed because the latch was missing. The 7 pin trailer plug was cut off and a 4 pin one was spliced in. Guy had never heard of adapters. Thought 7 pin was a scamp only thing. Rivet sizes to order was driving me nuts, no answer to email to the scamp store so I called them and they looked up what they had a record of. I will be creating a list of the rivet sizes as I replace things. Have ordered the parts and decals from the scamp store. They had most everything I needed except the window and stove parts. Will update this as I actually make progress using those parts. Trailer has 12 volt lights but no battery tray bracket or wiring at tongue, would like to add that. However will require moving the propane tank supports forward and shortening the jack handle to clear the tank. Would like to look into installing a 12 volt powered roof vent. Could run line from cupboard 12 volt light to vent. Only AC outlet is back under sink, might like to add a second one a little more accessible and GFI protected would be a nice touch. Feel free to offer suggestions, ideas or links that apply to this list. Please! Not sure what you can make of this one but I will throw it out there. I work in Florida a lot and have noticed that down there they have replacement Jalousie window parts everywhere! Every hardware store and many Walmarts carry some variety of them as I imagine there are still a lot of the windows in use where there are few freezing temps and the windows have just endured? I was able to easily find parts for both Trilliums I have had while down there when I could find nothing local here in the midwest. The trick of course os finding some way to research and purchase the parts since you are not in Florida? Like I said maybe not a lot of help but the availability out of my area would never have been known to me if I hadn't seen it for myself,so know you know! Well I agree with Donna, make sure it's safe to be on the road and then get out and enjoy it! Of course clean is a must ( I so agree with your wife on that one!) But have to say, some interior mod's are best done after you have camped in your trailer to see what mods are gonna best fit your camping needs. Oh and we like pic's here! Please post pic's of your projects! Did the camp store not have snap caps? If you can't find them, Casita has them, inexpensive and they can have them to you within the week. I am sure there are other places that have them too! Your Scamp sounds amazingly like mine! We got a '77 last fall and wanted to use it at least once before the end of the year. First thing I wanted to get working was the propane furnace and stove. Just like yours I found the regulator had rusted through, water got into the copper and it was burst in three places. All copper replaced and a new gas-grill style propane tank and regulator were installed. The furnace was a mess. I drilled out the rivets and removed the whole assembly. Wasp nests in every opening. Yuck. The capillary tube for the temperature control was broken off right at the bas valve. BooHoo. So I took the valve completely apart, cleaned and lubed everything and put it back together without the temperature sensing bellows. All gaskets and seals were in great shape. I hooked the furnace up to my gas grill propane tank regulator output and ran it in the back yard just in case there were problems. I got the pilot to light and to stay lit right away, so I knew that part of the gas valve worked, but when I started the main burner, all the flames came OUT of the air intake ports at the base of the burner. ??? I found out that the burner is in two parts that unscrew from one another, so I could get it apart and found a spider nest in there. Ugh. Cleaned it out and the burner ran GREAT! So now I have a working manually-controlled furnace! Removed and re-sealed the ceiling vent. Used bolts and acorn nuts since the fiberglass is a little fragile up there. I learned that if I didn't turn the gas valve fully on to "ON" that the burner would stay running. Maybe I have too high a gas pressure from the gas grill regulator. Any ideas? Second night, my son's sleeping bag froze to the front window, but we were all comfortable. This spring, we put on new tires, replaced the water tank, tuning and pump and drove 1,200 miles (and back) to New Orleans for spring break. Learned a lot about tire pressure and bouncing. The closet door opened and tore right off the hinges before we reduced the tire pressure to 20 PSI. Camping in MO, MN and LA was fantastic. Mosquitos in LA were also pretty fantastic, and I come from MN! Since then I removed and resealed one side window. Used rivets this time. Yesterday, we tore out the carpet, sanded the floors and plan on replacing it with sheet linoleum. Owning a '77 sure is a lot of fun! Alan Windows are so on my list, alge don't grow where it's dry, so green on inside around screen spline was my first clue. How bad was that remove and replace on the window? Do you have to drill out the whole line of rivets around the edge? Dirt is one thing but this elephant hide was filthy and sticky! Some of that "tape" is just dirt. Took this to remind me what overlaps what. It's all clean after this week end and I have a dehumidifier running to get it good and dry before retape. Used AWSOME found at $$$ store. My windows are the same as your link to the 76 window parts, I guess those are called tilt out windows. Just what I needed to know to get parts. your a good egg in my book for that link. I have my handles so will attempt to fabricate the broken brackets. And already have campground reservations for a long weekend, can't wait. Bracket repaired on fridge. Weld broke right at the pipe, used some sheet metal pieces to protect the wires, wrapped pipe in wet rags so it would not get too hot when re-welded. Not to sure that the weld or bracket would hold so clamped on the wood I braced it in place to weld as a support. Could not leave the whole thing flopping. Checked and fridge works on AC. Thanks for the tip on Fla. as a source, I have a brother in law down there. If I get stuck I can send him pictures and he can pay me back for being his email hoax checker. Found a woman that owns a sign shop in Howell Mi. with a very good reputation for doing custom decal work. Pretty resonable price for applying the scamp logo and stripes I bought at the scamp store. I could do this but she will do it right, figure that is worth paying for. 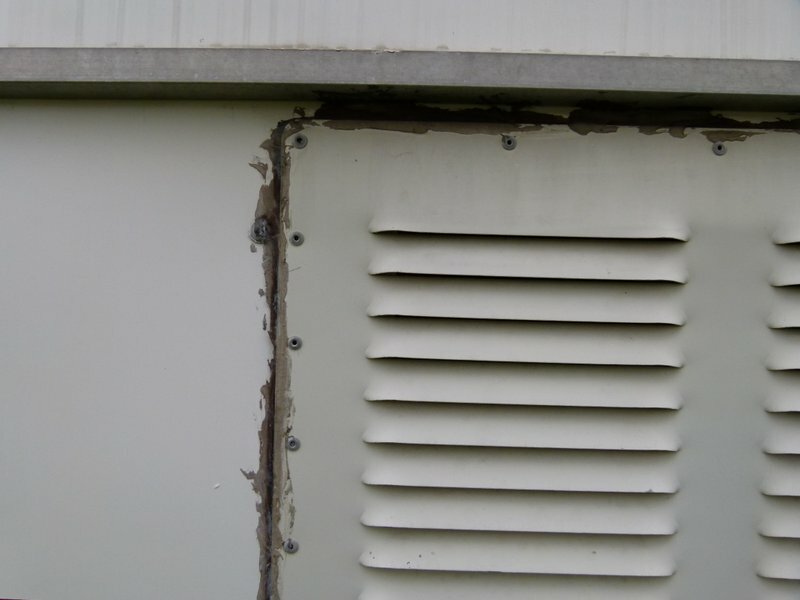 I have to remove this fridge vent and clean off the old silicon caulk before the stripe decals can be applied. Any residue can keep the decal from sticking. Consider this Photo evidence that this is NOT the caulk to use on a white camper. Also replaced the hinge pins, so now I don't have to worry about door falling off. The Time Machine - Welcome to 1978!